Sharjah, UAE: Sahara Centre has rolled out its new firefighting truck – the first such Rapid Intervention Vehicle in the UAE, that was purchased as a vehicle wholly devoted to the mall’s service and which is already on standby at the centre. Representatives from Sharjah Civil Defence (SCD), NAFFCO – the world’s leading producers of top-tier firefighting equipment, and the Sahara Centre Operation and Management team, together attended the official unveiling of the new vehicle. The move places the Sahara Centre at the forefront of international standards in safety and security, and is aimed at minimising risks and safeguarding the safety of all people visiting the mall. 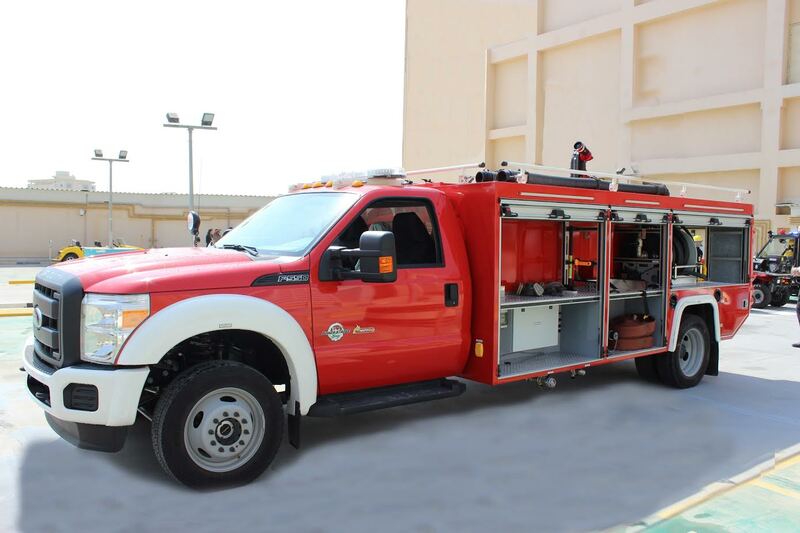 The vehicle is the first firefighting truck wholly devoted to a mall in the UAE and complements the centre’s already stringent firefighting equipment and rescue procedures. This state-of-the-art Rapid Intervention Vehicle is designed to operate in tropical zones at high temperatures and in a salt-laden, high humidity atmosphere, and conceived to provide ease of operation, safety, reliability and accessibility for repair and maintenance. The firefighting truck has a standard specification for a Rapid Intervention Vehicle, Model F-550, 4X4, and is built in accordance with the global standards of the National Fire Protection Association (NFPA). Sahara Centre is strategically located on the Dubai-Sharjah Highway and first opened its doors to customers in February 2002. The mall is home to an eclectic range of retail outlets with key anchor stores, including renowned brands, such as Adventureland, Babyshop, Debenhams, Emax, Fitness First, Novo Cinemas, Home Centre, Marina Home, Matalan, Spinneys, Toys ‘R’ Us and Zara. Sahara Centre is open from 10am to 11pm on weekdays, 10am until 12 midnight on Thursdays and Saturdays, and 10am to 12pm and 1pm until 12 midnight on Fridays.